A Prince George's County Public Schools building was renamed to honor the life of the first African-American man to direct any department in the school system. 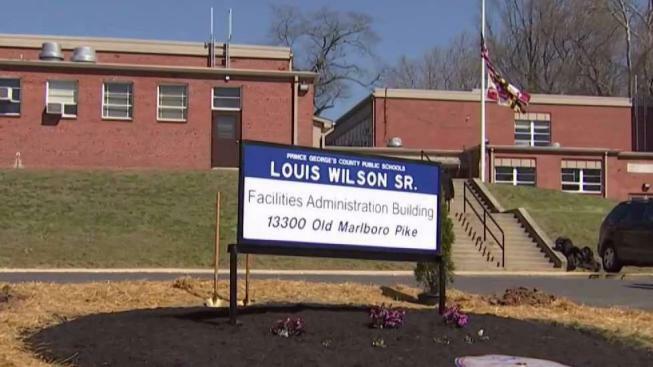 Louis Wilson began at Prince George's County Public Schools as a janitor when he was still in Frederick Douglass High School. In 1959, it became his full-time job. Seventeen years later, he was promoted and became the first African-American man to run a department in the district. "You never know how much your work and effort is going to impact generations to come," CEO of Prince George's County Public Schools Monica Goldson said. A celebration took place Wednesday to honor his life and the barriers he broke during his years of service. Wilson died last year. "The Wilson family is a great contributor to this community," Kevin Maxwell, former CEO of Prince George's County Public School, said. "They deserve to be recognized and their father deserves to have his name on this building." As director of plant operations, Wilson hired more minorities and mentored children of color in the school system. Currently, his son and grandson, both named Louis Wilson, work for the school system and are proud of their namesake. "He just wanted to do the right thing all the time, and you are seeing his legacy carrying on," his son said. "You see people of all walks of life out here celebrating him." Additionally, the school system now has an apprenticeship program that teaches students how to become janitors so they can work in the school system after graduation.